Our company offers taxi transfers from/to Antalya Airport from any city in Turkey. We offer most of hotel and holiday transfers for travellers in Alanya, Belek, Side, Kemer, Tekirova, Beldibi, Colakli, Fethiye, Okurcalar, Avsallar, Lara, Manavgat, that our most popular transfer destinations. The rates we offer are much cheaper and more comfort than when using a normal taxi. 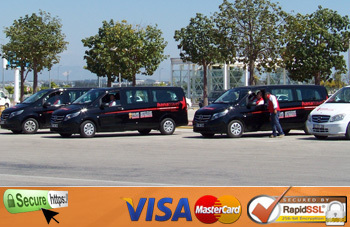 If you want to book an private taxi transfer from/to Antalya Airport, just fill in the form or call us. You can pay upon arrival by cash or by credit card online (advance payment) with SSL-3D, %100 secure payment. You can get also payment receipt from our drivers directly. Easy to book airport transfer and Payment. We operate exclusively with VIP Transfers & Tours. Our staff, drivers, tour guides are highly educated, experienced. We organize permits to access VIP-CIP halls or Fast Direct in airports and ports. The vehicles are new and luxurious. We organize special trips or special welcome or any type requirements. Please contact with us for VIP transfers in Antalya. All our vehicles have baby seats for junior travellers-no extra charges. Our vehicles has enough space for golf bags or extra bags, just inform us at reservation form. We will confirm the accessibility to the vehicle. All our vehicles are new, air-conditioned with maximum comfort while you travel. We will also give you a free printed visitor guide of Antalya. With our online booking facility it couldn't be simpler. If you prefer, you can also make a reservation by phone or you have some questions for your airport taxi transfer. Please, do not hesitate to contact with us for any assistance. Just check our contact page and you also would have our contact details in your reservation voucher by e-mail, keep in touch.. If your journey has multiple stops, our tailor-made transfers as the most cost-effective way to get to any destination within in the Antalya, Turkey. And, if you're travelling in a group, you'll save even more with our discounted rates for more people, just contact with us for affordable prices and professional services. Трансфер 15 апреля в Arcanus Side Resort. Все замечательно, удобно и комфортно. Спасибо!!! Пользовался услугами 29 сентября, встречали в аэропорту. Отлично встретили, хорошая машина с удобным салоном, вежливый и аккуратный водитель. Заказал трансфер из отеля в аэропорт. Всем рекомендую. Персоналу v Voyage Transfers большое спасибо. Пользовался услугой 13.09.2014 встречали Из Стамбула в Анталии,все отлично! Так же заказал обратный трансфер 21.09 в аэропорт,все вовремя и аккуратно. Exceptional service received from Voyage Transfers for me and my young family. Would recommend to all. Great value too. Спасибо за отличное обслуживание!Заказывала трансфер в Анталии,рекомендую! Sehr zuverlässig und professionell. Würde ich zu diesen Bedingungen jederzeit wieder buchen. Danke. Es hat alles super funktioniert. ich werde auch bei der nächsten Reise gerne auf Ihren Service zurückkommen. Vielen Dank, guter Service. Для организации индивидуального трансфера воспользовались услугами фирмы Voyagetransfers. Машины новые и комфортные, приезжали вовремя. В следующий раз обязательно будем заказывать трансфер у вас. Уважаемые друзья! Благодарим за помощь в организации трансферов для нашей семьи.При случае мы обязательно воспользуемся услугами вашей компании.Желаем удачи и всего наилучшего. 28.06.12-12.07.12 Antalya- Goynuk Excellent!!! very happy! High service, all at a time of comfort! many thanks! Excellent ! Ontime at thr airport antalya , very good service. Back from belek to airport the driver arrived on time. Thanks for the excellent service. We are very pleased with everything and would absolutely recommend anybody to make there reservations with you. Excellent service.We have to the transfer Antalya airport to colakli.The drivers arrived on time and were very efficient and friendly. I would not hesitate to use the company again. The driver that picked us up was brilliant!! Even though he could not speak a word of english we had such an enjoyable journey to our resort!! What a laugh!! For our party of 15 people, we were so impressed with the airport transfer from Antalya airport that we were happy to book voyagetransfers again for our return journey. Outstanding service. Efficient and offering great value for money. Best way to and from airport while holidaying with family!! Wir waren viel zufrieden mit Ihren Service in Antalya!Vielen Dank voyagetransfers!! Excellent, Professional Service! Best price given and very reliable. Will definately be using voyagetransfers again! Thanks! We were early at the airport, but the driver also! Perfect! Very helpful and nice. So thank you for the nice transfer! İstanbul Atatürk Havalimanından Sultanahmetteki otelime çok keyifli bir yolculuk geçirdim, şehir hakkında beni bilgilendiren şoför arkadaşa ayrıca çok teşekkürler.. Belçikadaki arkadaşlarımada sizi tavsiye edeceğim emeği geçen herkese teşekkürler. mert! I didn't need to contact customer services at all, they contacted to confirm my booking as they thought they had a mix up and were very polite and reassuring about it. the drivers were there early and patiently waited for myself and my boyfriend. Wir waren sehr zufrieden und werden Sie gerne weiter empfehlen!! The service was first class could not ask for better,drivers were there on time with our names a mr. gordon displayed,will definitely use the service again. Voyagetransfers are a good company to use, had no problems with them, no problems with the driver's always on time, would use again and recomend to others! The transportation vehicle was excellent, and the driver very professional.We will use voyagetransfer again next year! İstanbul and antalya city thank you very much! Так как я использовал гарантии трансфер, я хотел бы выразить профессиональное обслуживание, что ваш драйвер с вами и очень обаятельный. Я буду пользоваться вашими услугами дальше. ...your driver has been very professional! your driver service is very important for turist industry in your beautifull country. I think from turkey airport best company for transfer. Ich danke Ihnen sehr voyagetransfer für den ausgezeichneten Service in Antalya, diese war unsere erste Mal dorthin begeben, und wir hatten einige Sorgen. Aber es war alles perfekt organisiert und wir hatten einen schönen Urlaub! Excellent service. From pick-up at airport at 22:30 to pick-up from holiday apartment at 05:10.On time and pleasant. By far the cheapest transfer we could find. Both drivers were courteous and helpful and we will not use anyone else for our future trips. We were very satisfied with your service. The driver arrived on time and we arrived at our destination at the time we expected! We would use your service again! Super service, courteous drivers, on time both ways and got us to our destinations quickly and efficiently. Would highly recommend to anyone. Plus a great price. Excellent transfer in an exceptionally clean mini-bus. The driver was extremely helpful, and my 87 year old mother was comfortable for both journeys. Have already recommended Voyagetransfers to family and friends. This was the perfect choice I made. The driver was there waiting for us even when our flight was delayed. Very impressive service. I will reccomend your service! Service absolutely perfect, was great way back driver before time already waiting for us. Will use your services again at any time and let people know also to do. I would definitely use your company again as it is very convenient to be picked up when you arrive at a foreign destination and if you don't know the city it is easy for a taxi to overcharge by taking the 'scenic' route to your hotel. Everything was perfectly OK! Thank you very much! Next transfer will be with YOUR Company without any doubt. I was very impressed by all, web page, customer service and driver Well, I will be using you on my travels again. As a single traveller it was a very re-assuring service, well done to all concerned. Действительно легко забронировать онлайн и услуг (в обоих направлениях) было превосходным. Кроме того, было дешевле, чем если бы мы заказали такси непосредственно через наш отель. Excellent service throughout the whole process. Cheapest price we could find and the service was excellent. Would definately use Voyage Transfers again!! We arrived at our destination, and the guy's were to greet us on time and the transfers were prompt. I wanted to send my appreciation of your service and the professionalism of the drive who transferred me from Antalya airport to Side and back yesterday. He was a professional. The car trip was a pleasure! Wir leben in der Nähe von Antalya, und den schnellen Service, und höflich englischsprachigem Fahrer war sehr beruhigend. Wir würden nicht in empfehlen dieses Unternehmen zögern. We had the same driver for both arrival and departure. He was fantastic, and took care of all of our baggage.- and the vehicle was spotless! Will definitely use VOYAGETRANSFERS again! well done. We were very happy with the proffessionality from Voyagetransfers. Our driver Mesut was very helpfull and explained us a lot about the Antalya! waren extrem schnell bei der Verarbeitung meiner Zahlung für einen Transfer. Antalya Flughafen-Transfers = Voyage Mitarbeiter waren sehr geduldig und hilfsbereit. Ich bin mit dem Service bei Antalya zufrieden sind. voyage transfere sonsuz teşekkürler kış ayı olmasına rağmen sorunsuz bir transfer hizmeti aldım emeği geçen herkese teşekkürler..
Tout s'est bien passé,le chauffeur était là à l'heure.Merci pour un voyage fantastique sur Kemer. Our Driver gave us a wonderful commentary on Antalya on our way to our hotel.He really set up our holiday. J'ai trouvé voyagetransfers en ligne avant de nos vacances à Antalya, Turquie. J'étais un peu réticent à l'utiliser. Je suis heureux j'ai fait comme tout le séjour était facile, sans tracas attentes libre et dépassée! Eine sehr professionelle und zuvorkommende Betreuung. Die Übertragung entfernt all die Probleme auf dem Flughafen mit Mietwagen verbunden und ist sehr schnell und deutlich billiger. Wir verpassten unseren Flug nach Antalya für den reservierten pickup, hatte aber kein Problem Neuordnung ein Pick-up für den späteren Flug. Beeindruckende Service. We used your service for airport transfers in Antalya. The service we received was excellent, the car from the airport was excellent, however the seats in the car on the return to the airport were comfortable and a clean. Ont utilisé les transferts voyage avant et a été tellement impressionné et c'est pourquoi j'y suis retournée. Service de première classe! Je vous remercie. having paid crazy money for taxis from airport to destinations before I found this service and thought i'd try, great prices and perfect sevice at Antalya airport, would use again highly recomended ! En un mot un très bon service, excellent rapport qualité-prix et une expérience globale amicale et professionnelle. Nous recommandons vivement et utiliser le service à nouveau .. Both in Side and in Antalya, the drivers were friendly, polite and on time. They opened the passenger doors for us, and loaded and unloaded the luggage for us. Very smooth service in both places. Thank you. From Antalya airport to our hotel, we were impressed with the quality of the transfer vehicle. The driver was waiting for us at the airport,was helpful and polite. Our return transfer was also on time and efficient. The drıver was very courteous and very helpful, offerıng some ınsıghtful tıps for my vısıt to Antalya-konakli. I apprecıate hıs good servıce. We took your service in Lara and Antalya and were very satisfied in both cities. Pick up was always ontime and vehicles comfortable and clean. 'Will definitely recommend you. This was a great service to use and I have already recommended them to others. I will be booking with them again. Have used company several times. This time had a couple of minor hiccups but will use them again in the future. Always very helpful. Thank you very much, you should expanse your service, so that there are more is possible, likea transfer to another sightseeing point! But the airoport transfer was excellent! Our inbound flight was late in but the driver was still waiting so thank you for that. For the return journey the driver was early and happy to wait for wich we were grateful. Thank you again. I found the service excellent, I twice spoke to the assistance helpline both times the representatives were very helpeful. The driver was waiting for me on my arrival and was very courteous throughout, as a woman travelling alone I felt completely safe. Voyagetransfers is an efficient and reliable company,from booking online to pick-up.I found the taxi driver helpful and very professional.I will definitely use this company again in the future. Our driver was waiting at arrivals when we got there, smartly dressed and with a very clear sign, unlike some others we saw! Very helpful and polite in spite of the language barrier. The car was immaculate the journey smooth and fast. We were very pleased with the voyagetransfers experience. The driver was exactly on time, the vehicle was clean and tidy and experience was very unstressful! Wir waren sehr zufrieden, wenn unsere Fahrer pünktlich am Flughafen und im Hotel war. Wir hoffen auf voyagetransfers wieder in der Zukunft zu verwenden. It was a great experience. everything was very well organized, the driver was already waiting for us on the airport, and on the return trip he even was 20 minutes early. i would recommend your service to everbody i know. I would use this transfer company again and have already recommended it to a few people. Even though we were 1 hour delayed the driver was waiting with a card with my name on and lovely air conditioned car. Absolutely first class service. The car was a luxury model and the driver was waiting for us on arrival. The return journey was just as good, same driver, same service. Would recommend to anyone and will use again. Excellent experience. Driver waiting on arrival at the airport. Courteous, prompt and efficient service outbound and inbound. Have already recommended the company to friends, who's experience of the service was also excellent. Knowing I had a pick up at the airport already organized made my arrival in an unfamiliar city so much more hassle-free. It was not expensive either! Great service was provided both ways on Antalya-Olympos route! Driver was polite and helpful and always in time! Thank you very much! A first class transfer service from Antalya Airport to the city center which I would highly recommend.